How is it that I am 41, and I have NEVER read a Roald Dahl book? That is a real shame. I have my nine-year old son to thank for introducing me to Dahl's genius. Of course, I knew who Roald Dahl was, and I have recommended Dahl's books many times over my years in the library. But in not ever reading Dahl myself--not even as a kid--I was missing out on the sheer FUN of his writing! Today, I'm reviewing two books I read with my son recently and encouraging all of you to invest a couple of hours into discovering what Roald Dahl books have to offer our young readers. SUMMARY: An eight-year old girl hates that her neighbors love to hunt. When she gets angry, her magic finger goes crazy. In this case, the finger turns the tables on the neighbors, who find themselves transformed into ducks. REVIEW: I read this book and The BFG aloud with my 9-year old son. Though my son has struggled considerably with reading and writing (he's dyslexic), he has always loved being read to. He understands very well when he hears a story, and his insightful commentary and memory of a story's events have surprised me many times. Anyway, I didn't write this review to really review the books. These books have been available for decades, and I really have nothing new or fresh to add to what's already been written. I would imagine many in my audience have already read these and other Dahl books. You are either a fan, or you are not. They make great read-alouds. If you have any children, grandchildren, or students in your life, have them pick a Dahl book for a read-aloud. These would also be great to read aloud to the elderly or people who may be unable to read on their own. Some, like The Magic Finger are very short and could be read in one or two sittings. Odds are good that the kids you read these books to today will be reading them to their own kids one day. Roald Dahl was dyslexic. Children with dyslexia face tremendous struggles in school. Hearing that Dahl hated school and got bad reports (read the section at the end of The Magic Finger) will help encourage these students and show them that dyslexics can and often do experience tremendous success as adults. They are funny. Who could read the whizzpoppers scene in The BFG with a straight face? Not us! We read it twice and still laugh at the mere mention of whizzpoppers. And all those weird, made-up words have given my son and I a secret language. We bonded over frobscottle and snozzcumbers. Seriously. They are a lighthearted way to discuss more serious issues. So I've only read these two at this point, but The Magic Finger could be used to discuss animal rights or how to handle your anger. Compare Mr. Gregg's calm, go-with-it attitude after being turned into a duck with the little girl's inability to control her magic finger when she gets angry. The BFG could be used to talk about bullies and how even the smallest friend can help you find the courage to stand up to your fears. They are great for reluctant readers. They are short. They have illustrations to help break up the text. Most kids will already be familiar with Dahl's work, and if they are not, there are several movies of his books (a new one--The BFG--comes out this summer!). All of these things will encourage reluctant readers to give Dahl's books a try. THE BOTTOM LINE: Roald Dahl books are classics that our children will likely read to their children. I encourage anyone who hasn't read one before to find a library near you and check one out! STATUS IN MY LIBRARY: We have 16 different Dahl titles. 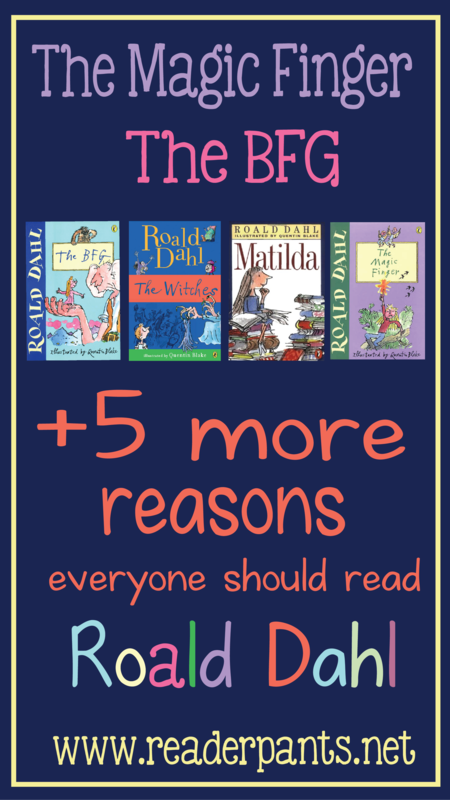 They are all popular, especially because I'm in a British school (Dahl is a British writer). They were popular in my American school as well, but they really fly off the shelves in my current school. Teachers and homeschooling parents might want to check out these Roald Dahl resources. The first book, Lit Kit Set is Kindle edition only (not available on Follett, sadly). Based on a positive review from a library colleague, I just ordered Gateway to Reading for my school library.